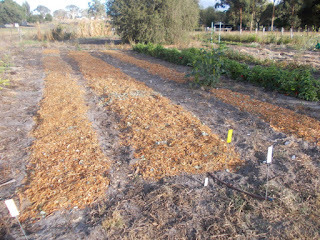 During the last couple of days I have been getting stuck into that big mulch pile and putting in on my garlic beds. Hopefully I won't have the weed trouble that I have been struggling with the last few years. Here is a trial plot to compare my new selection of garlic (Easy Gro) with the original parent which I have been growing in a separate block for the past few years. I also have a couple of other garlic growers doing the same comparison. If everyone reports a measurable difference then I will offer Easy Gro to the public next year. Easy Gro has been selected to withstand the wettest winter/spring times that kill off other varieties, and sill produce marketable bulbs. As a bonus it also seems to cope with high weed pressure better than any others that I have grown. Next in my series of native foods of [continent]. Some will be known to you, and some are a bit rarer. Although many people consider skirrit a European vegetable, it actually originally came from China. 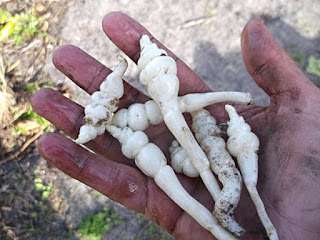 It is related to parsnips and grows similar to them. Usually the roots are a bit cleaner, without so many tiny rootlets (and bigger) than this but it was a harsh year for them this year. 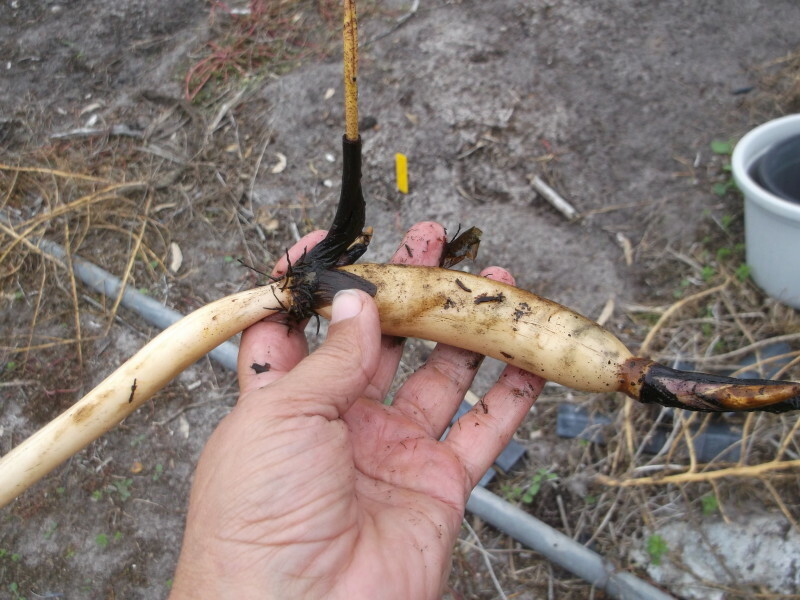 I am sure that when I dig up the larger, better grown plants the roots will be much bigger. 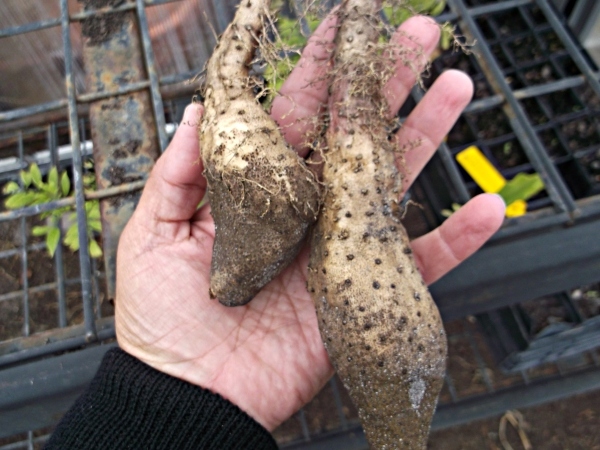 They are a root vegetable that will grow in most soils. They are not super productive but the ease of care can make up for that. The flavour (to me) is a mixture of potato and parsnip. I don't find it sweet like many sources suggest, and mine are never tough or fibrous. I like to microwave the roots till tender then serve with butter or white sauce. No need to peel. The flavour is similar to potato but it has a sticky texture that really fills you up. You should grow it in a raised bed that you can dis-assemble as the root will grow very long, over a metre, and it is fragile so you have to be careful when digging. It is a vine so give it something to grow on. Although they never do in my climate, sometimes they will produce little pea-size tubers along the stems, these can be cooked just like peas. You should take all these off so they don't spread throughout your garden and become a weed. Lotus root is another favourite of mine. Lotus is a water plant and looks like water lilies. I only have a small variety which is why the root shown is not as large as the ones you can buy in city markets. 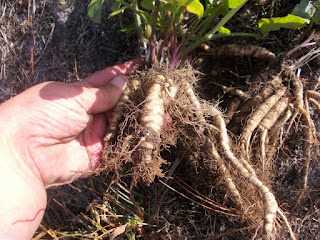 The roots are harvested when the plant dies down in winter, then scrubbed 9or peeled if they are older roots). Then slice and pop into acidified water before cooking. The flavour is mild. They are good raw or stir-fried, and I also like them microwaved. 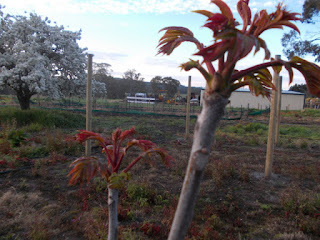 This is a tree that produces delicious spring shoots that are often chopped and added to egg dishes. The flavour is a bit like onion. Some people don't like it but I love it. Be aware that this tree suckers badly so is not suitable for a small garden. The suckers can be kept down with regular mowing. This crunchy, small tuber is great to add texture to salads. it doesn't have a lot of flavour though. The plant is a groundcover distantly related to mint, and like mint it likes to be well watered in summer. Some people find it a little invasive but it has never been a problem in my poor soil.